DO YOU NEED DIVE LOG FILLER PAGES? Over the years our students have complained about having to purchase additional dive log filler pages after their open water training course. Some students wanted a dive log page just like the student pages while others wanted a dive log page that they could record more information about their dives. We took all their suggestions and designed and created two different dive log filler pages for our students. The filler pages contain common information areas to record general information about the dive (environment, dive type, dive activities, conditions, tidal, weather, temperature, visibility, weights, exposure suit, and comments). 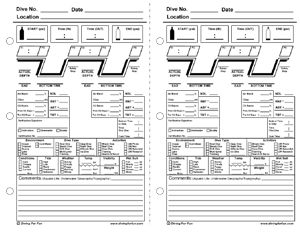 One dive log filler page has been design to include areas to record information for repetitive dives along with recording enriched air (nitrox) information. The other dive log has been design to record information on multi-level dives. 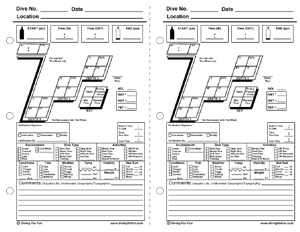 Each of the dive log filler page has been designed to be printed in duplex (front and back) mode on a 8.5" x 11" plain white paper. The template will create four (8.5" x 5.5") dive log filler pages from one (1) 8.5" x 11" piece of paper. We even included a reference line to cut the pages once they have been printed. Feel free to download the templates and use them when you need additional filler pages for your log book. Print several pages and share them among your diving buddies. If you have any suggestions to improve the templates, please contact us and we will try and incorporate your suggestion for other divers. We will be glad to customize the templates for your dive center with your company logo and address for a small fee of consideration. The fee could be as little as a link to your website? You need Adobe Acrobat Reader 7.1 or greater installed to print the dive logs. If you do not have Adobe Acrobat Reader 7.1 or later installed, you can upgrade to the latest version FREE by clicking on the Adobe image to the right.